Not just for pleasure - but for work too! 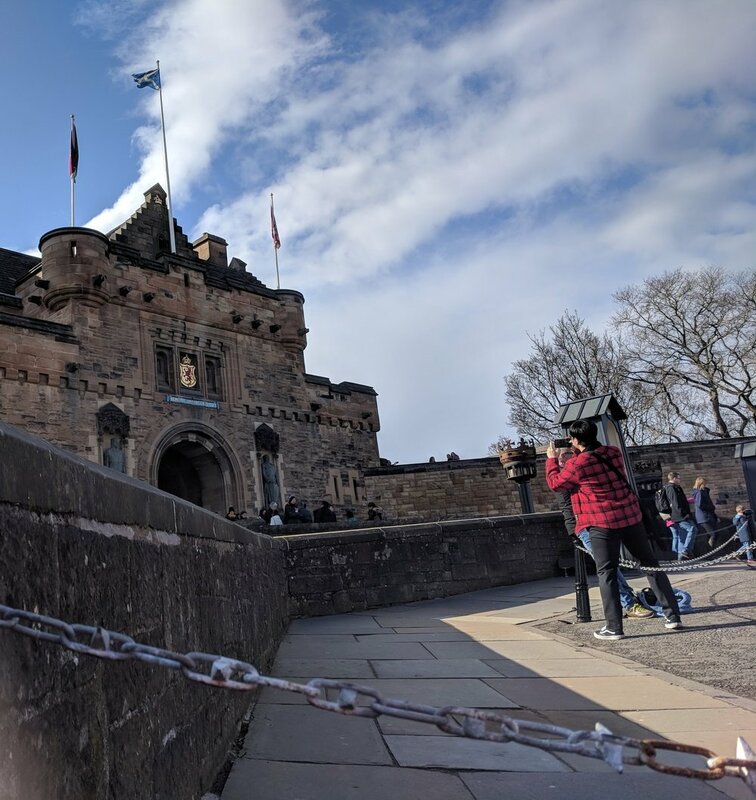 Earlier on this year I had the opportunity with work to undertake some video production training in Edinburgh. Obviously, I went along and so did my camera. However as we were there for only a short time and with majority of the day being taken up by work I had to be wise with how I spent my free time. So I landed in Edinburgh around midday and then transferred to my hotel from the airport via the train. Once I had unpacked, settle in to my room and tackled some work emails it was time to go down to the lobby to meet my collegues for a little explore around the city. We started our small makeshift city tour just outside our hotel in Princes Street. Princes Street is one of the major shopping streets in the city and was full of many high street favourites as well as a few designer boutiques. Although I was pretty enticed by the shops I resist the urge to burn a huge hole in my pocket and instead made my way down the street until I saw a park on the opposite side of the road called the Princes Street Gardens. Before entering the main part of the park, on the corner was the Scott Monument. 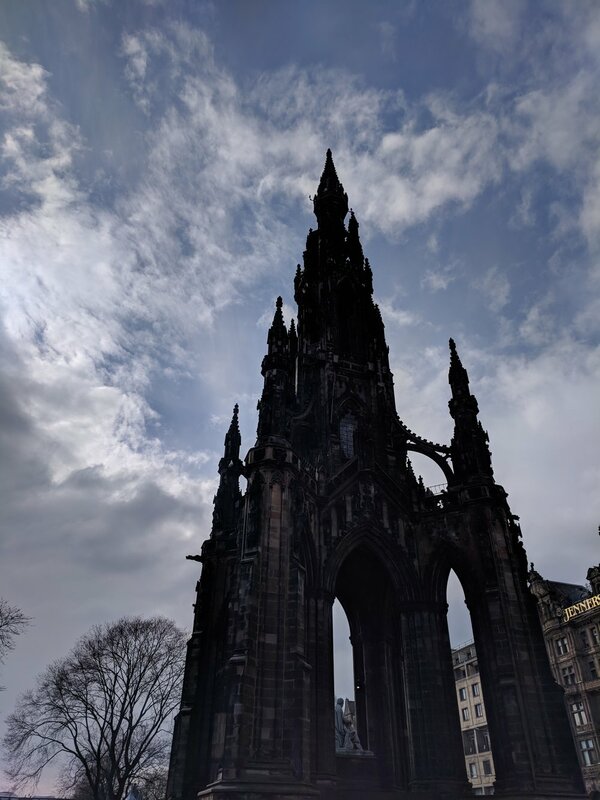 This is where I learnt that this stunning gothic structure is a monument to a Scottish author named Sir Walter Scott who wrote a variety of famous novels, poems and plays. You can actually climb the monument up 267 steps, however due to my time restraints I snapped a few quick photos and hiked on. Strolling through the park was really pleasant and it actually reminded me of all the green space I am accustomed to in London. The park was rife with gorgeously manicured flower beds and a scattering of beautiful daffodils. I'm not sure exactly how but I found myself walking from the gardens up towards Edinburgh castle. The walk was pretty steep so I would recommend wearing comfy trainers and not the only pair of heeled chelsea boots that I packed. Oops! Finally at the top of the hill, I saw Edinburgh castle. It was built in the 11th century on Castle Rock for, what I can only assume, tactical advantage if the settlement was every attacked by raiders or the like. The castle itself has been modified and added to in the many centuries leading up to now so it's a really interesting juxtaposition of architecture. I didn't go inside but I did spend a while admiring the building and the amazing views . Cue the above views that I just had to snap! I was really surprised by the vast views and sights I could see because although the walk up was rather steep, I didn't feel like I was climbing that high at all. The first image was photographed on the south side of the castle looking over the university. It was really great to be able to see the entire university and the surrounding area. The second image I took was of the skyline of Edinburgh's Old Town which is east of the castle. Similarly to the castle the Old Town is full of various different types of buildings from different parts of history so it's really wonderful to look at. I particularly like the contrast between the white Bavarian looking houses at the front and the dark gothic steeple slightly further back. Speaking of gothic steeples I couldn't resist getting a close up of the one at St Columba's church - there's just something about gothic architecture that I adore. 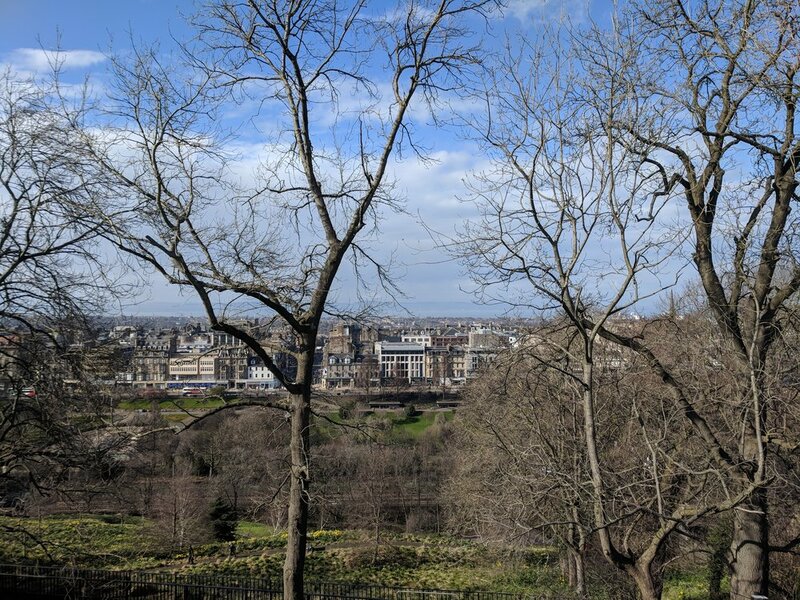 Finally, the last photgraph I took at the top of the hill was the view overlooking Princes Street park and the New Town. After I had taken way too many photos of all of the possible views from Castle Rock it was time to take a wander into the Old Town. Secretly, this was my favourite part of Edinburgh. Like I said I adore gothic architecture however I also adore any sort of architecture dating back to the Medieval times. All of the buildings were so quaint and slightly creepy with many different shops underneath selling anything from tartan scarfs to whiskey (very Scottish!). Of course, I couldn't walk past the famous St. Giles' cathedral without taking a quick photo either. Photographing cathedrals is always so much fun because there are so many angles to choose from to capture their grandeur. 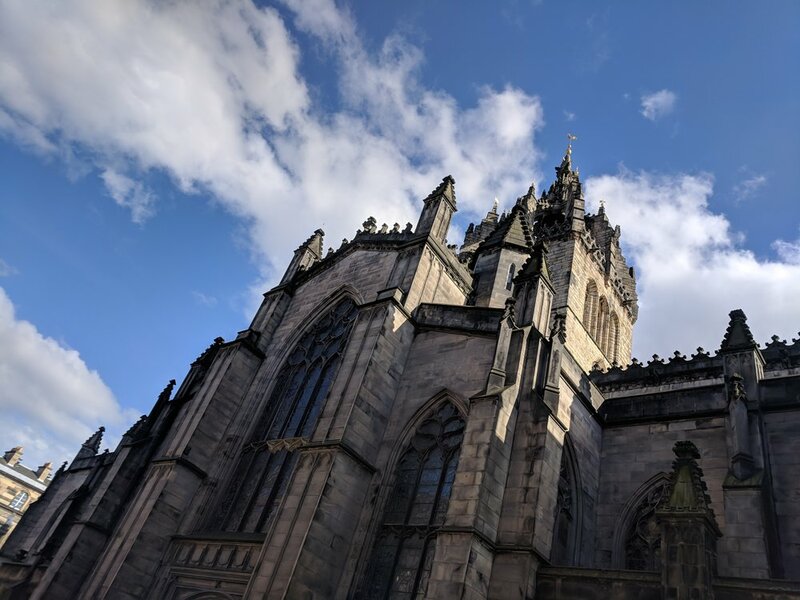 St Giles' cathedral has been Edinburgh's main place of worship for approximately 900 years. Before it was known as St Giles' the cactherdral was called the High Kirk of Edinburgh. 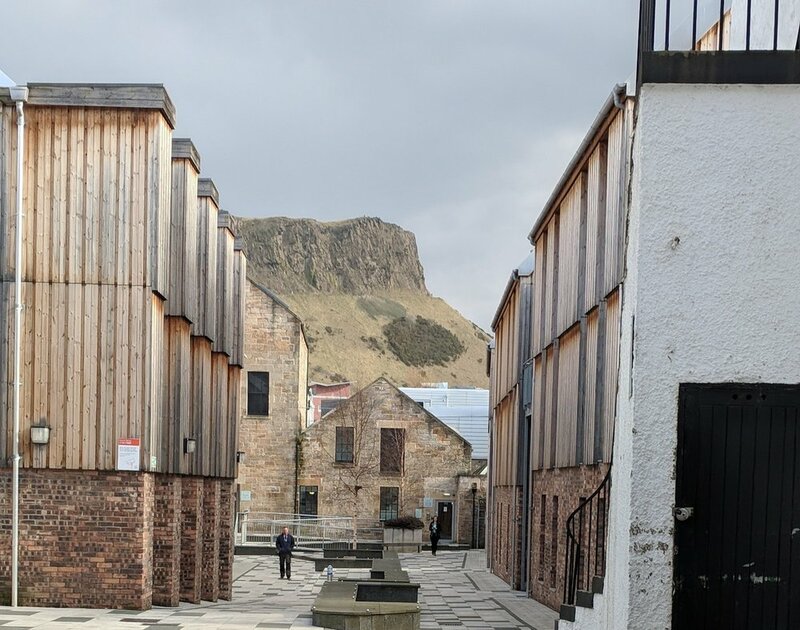 After walking through Old Town I stumbled across this perfect view of the university halls framing Arthur's Seat in the distance. Arthur's Seat is basically the main peak of a group of hills in the city that helps form Holyrood Park. If you know me then you probably know I was itching to put on my hiking boots (which I hadn't packed!) and scale the monster of a hill myself. Unfortunately this time I didn't but at least I have something to look forward to the next time I visit. By my hotel receptionist recommendation I found myself striding up another hill in Edinburgh called Calton Hill. And I have to say I was not disappointed when I reached the top. The hill is home to many wonderful landmarks as well as some outstanding views of the city. Above, you can see an image of the National Monument of Scotland which is national memorial to all of the Scottish soldiers and sailors who died in the Napleonic wars. On the other side of the hill you can see another historical landmark called the Nelson Monument. The Nelson Monument was built between 1807 and 1815 and is a commemorative tower in honour of Vice Admiral Horatio Nelson. I was impressed by the complete panoramic view from the top of Calton Hill where you can also see Arthur's Seat even more clearly as well as a breath taking view of the city. After I climbed down from Calton Hill it was unfortunately time to call it a day. I went back to my hotel, had some haggis (obviously) and went to bed to prepare for a full day of work and training the next day. 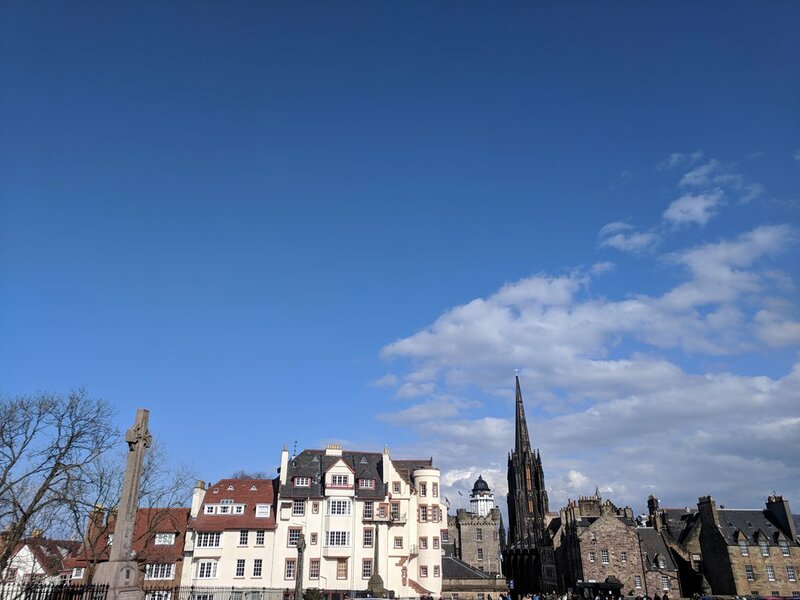 Although my time in Edinburgh was short I enjoyed every minute of my 24 hour tourist escapades and would definetely vist the city again to explore the many things I missed out on.